You can only export your shopping list in PDF format using the full version of ikea's website, this feature is not available in the mobile version. To open the full version of the site, click "Full site" at the bottom of the mobile site. Go to the product page of the item that you want and click "Add to shopping list". 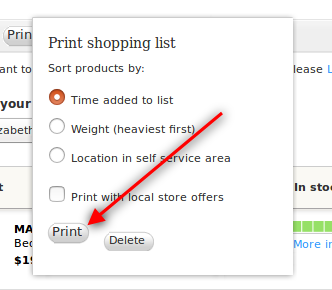 When you are done creating your shopping list, click "Shopping list" icon at the top of the page. Select IKEA Elizabeth in the drop down menu, click "OK" button and click "Print". Click "Print" again and a PDF file will open in a new tab. In your browser's menu click "File -> Save As" and save the file on your computer.